As a licensed Q Grader, I cup coffee on an almost daily basis. I find the cupping process to be an invaluable decision-making tool that enables a precise insight into the quality, flavour traits, defects and potential longevity of coffee. The Specialty Coffee Association (SCA) cupping standards have become a well-established methodology for evaluating coffee quality and a major contributor to our flourishing specialty coffee industry. The cupping protocol has driven a deeper understanding of flavour influencing factors such as origin, terroir, genotype, processing, roasting, and brewing. However, there is one area of the coffee industry that might benefit from a re-think and re-application of the cupping process to reach the full flavour potential. You see, it’s not uncommon to hear of the SCA cupping protocol being applied to not only green bean selection and filter roasting (where it is highly applicable and invaluable), but also as a means of quality control and product development for espresso roasts intended for milk coffee. The application of cupping in the context of espresso roasts is not to score the coffee in a traditional sense but to understand the relationship of flavour and quality between a cupping brew, and the same coffee extracted through espresso machine and prepared as a latte. However, when it comes to espresso-based milk (or alternative milk) beverages, such as lattes, cappuccinos and flat whites – the prevailing choice by Australian consumers – I’m far from convinced that applying the current cupping method enables the optimum outcome for coffee quality assessment. From my experience of cupping Zest’s production roasts, I had the regular feeling that through cupping alone, I was unable to obtain the type of detailed information needed to make well-informed decisions about our coffee. Just to be clear, I’m not talking about cupping for roasting consistency week to week. Rather, an approach to our espresso roasting that would be much more precise and enable greater opportunity to discover traits and formulate theories that could change the way we approach roasting, sourcing, and blending our coffee altogether. Over time, it became very clear that if Zest was going to keep evolving and take our roasting, sourcing, and blend compositions to new heights, we needed to develop a new approach and framework for evaluating milk coffee quality. We also realised that the established cupping process wasn’t designed and intended to offer great insights into espresso-based milk coffee. So, after a period of brainstorming and experimenting, the latte cupping was born. I’ll be the first to admit that latte cupping is not a revolutionary idea. It employs much of the same approach used in a normal cupping, but with a well-prepared latte as the focus of quality evaluation. I’m also aware that every roaster does taste their milk coffee regularly, but I’d like to make an important distinction here: a latte cupping is more than tasting coffee. A latte cupping is a different way of thinking about the aspects of quality that constitute value in milk coffee. It opens the door to the same type of creative – and design – focused thinking that has been so consequential for the development of black coffee over the past decade. In practicality, there is nothing overly complex about preparing latte cupping. It applies the same rules of contextual comparison as a normal cupping to discern the quality of the brews. 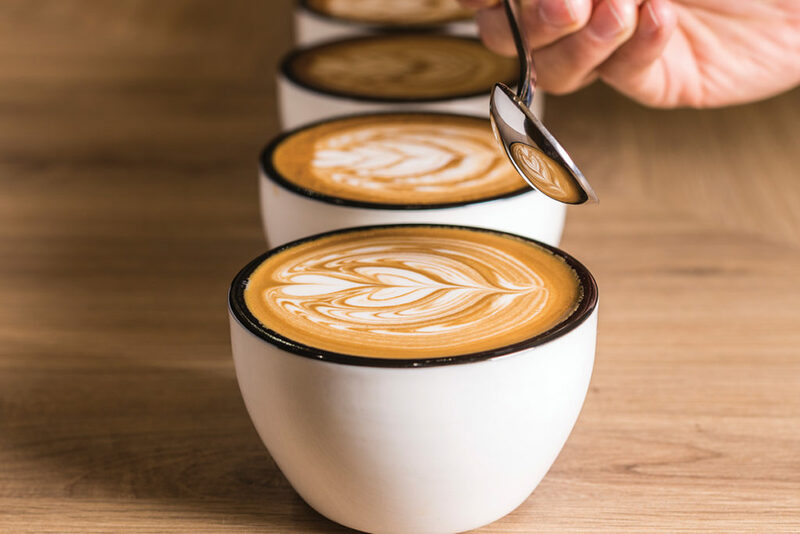 You simply prepare a line of lattes, wait until they cool to a consistent and stable temperature, and, with the use of a cupping spoon, make your way around the table slurping and tasting while marking down scores and comments on an evaluation sheet. One element we were careful to implement was to re-create a real-life café environment for the coffee used in our latte cupping. This means we decided upon extraction parameters, an extraction percentage, and a milk-to-coffee ratio that could be broadly applied to many café situations. This allowed for variances in machinery, water composition and barista skill level. Interpreting the quality of the lattes and putting words to specific sensory experiences required substantial consideration. There have been decades of development for the specific and plentiful vocabulary used to describe the nuances of black coffee. These terms contribute to a framework of thinking about black coffee, but for milk coffee, nothing of the like currently exists. On a surface level, tasting a latte might seem quite clear and simple, however, it’s not as straight forward as one might think. This is because you are not tasting one single product but the dynamic interplay between two products. Furthermore, the presence of heated and textured milk substantially changes the expression of coffee and it is the successful synergy of the espresso mixed with the milk that needs to be evaluated in terms of quality. The Zest milk cupping score sheet is still in a developmental phase. So far, I have borrowed the concepts of aroma, sweetness, and aftertaste, from the SCA scoresheet, which lends itself to be applicable for both black and milk cupping. I have also added five concepts within the umbrella term ‘dimensionality’, which are particularly suited to evaluating the milk coffee experience. Intensity: The adequate presentation and strength of flavour character. Tactility: The weight or heaviness of the coffee on your palate (think olive oil or apple juice as opposed to water). Complexity: The harmonious combination and interplay of flavours, which enhance the total experience (i.e. not one dimensional or plain). Temporality: Flavour change over time, or the change and development of flavour within a single taste (i.e. not a stagnant and stable experience but something with a flavour form – an introduction, middle, and ending). Synergy: The successful and harmonious interplay between the above-mentioned dimensions contributing to the overall success of the flavour. The development of the milk cuppers framework is still in its early stages and there is still much to learn and discover. What I feel we have created is a milk coffee compass to enable further discussion and guide change relating to the impact of our roasting, sourcing, and blending decisions on milk coffees’ final flavour. I hope that this article, and our framework, can acts as instigators for a change in thinking about milk coffee and reallocate some of the passion and creative energy applied to black coffee for benefit of the milk coffee experience and its consumers.